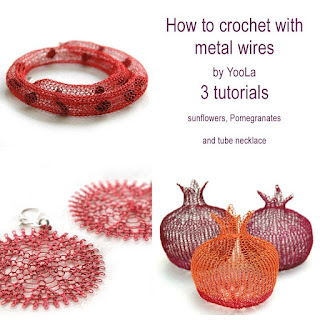 3 (THREE) One of A Kind (OOAK) detailed crocheted wire jewelry tutorials with many images, illustrations and explanations, no special knowledge is required to follow it and create the designs. Go and take a look, and see what else Yael have for you on http://de-cors.com - remember, you receive 20% discount off most items if you check out three or more of them (excluding packages), and this is something you won't get else where, thanks to all the guest artists for being generous! By the way, I have been wondering if I should get Melaleuca Wellness Guide 14th Edition - I have been using their products, have you? Share your thoughts if you have! Til then, have a blissful weekend!